Get to know Safed like an insider and become acquainted with the people of Safed through our articles on Safed Personalities. 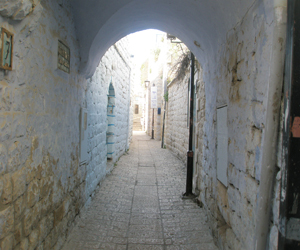 Safed has many interesting and eccentric characters and you can begin getting to know the personalities that make up this mystical city before you even begin your journey to Safed. By familiarizing yourself with locals before arriving in Safed, you can increase your sense of returning home and lessen your feelings as a foreigner or as a traveler while exploring this inspiring city. As Safed is most famously known as the city of Kabbalah it would seem only right that we begin our introduction to Safed personalities by introducing someone whose life is directly influenced by this mystical book. Find out a little about Amanda Cohen, a local writer and teacher of Kabbalah and find out more about how the Kabbalah influences the local residents. Also meet Yehudit Goldfarb, well known throughout the city for expression through Jewish letters and a local Kabbalist. Find out more about his point of view. Also check out our articles on the various religious communities in Safed like the Chabad community and the Breslev community, discover Hassidic Messianic thought, and learn more about the political ideology of Tzfat. For everything you ever wanted to know about Safed try getting in touch with the local historian David who is known throughout the tourist circles a David the Tour guide. Also get to known a native Tennessee residence, Batya Avraham, who now calls Safed her home. Find out more about how she made this incredible transition. And of course, no visit to Safed would be complete without an introduction to Banjo Billy, the cat lady, or to Nissim and his Dobermans, a local landmark. Also check out our articles on charity in Tzfat, the Ben Baruchs, candle sculptures, legends of Tzfat, residents' stories, the beggars of Safed, the Sterns, new immigrants, Reb Moshe, a British expatriate, Mimi Semuha, and the Tzfat Guide book.